Timeless, chic and stylish, this Nature Classic 14K Black Gold 1.0 Ct Black Diamond Pink Sapphire Leaf and Vine Engagement Ring Wedding Band Set R340SG-14KBGPSBD evokes absolute beauty and elegance and is sure to please your special one. 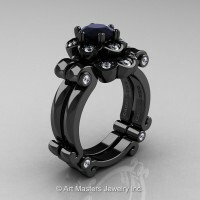 Black rhodium coat on 14k white gold will wear off in few weeks to few months, just like any rhodium does, providing vintage look to your jewelry. 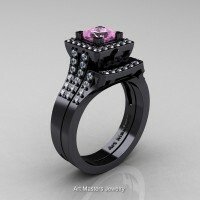 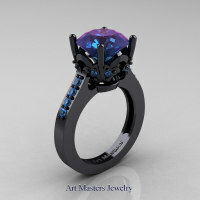 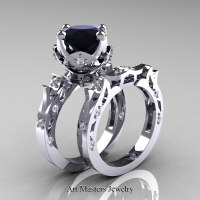 We provide two year (two time) free black rhodium reapplication on all designer black gold rings for our customers. 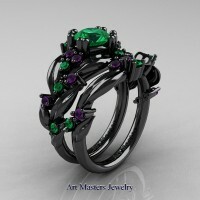 * Sale on all black gold rings, black gold ring sets, black gold jewelry are final, not returnable, not refundable. * All metal and stone measurements and weight totals are approximated by production manufacturing computers and may differ slightly. * Stone settings in pave, prongs, bezel, channel or invisible may differ slightly from an image. 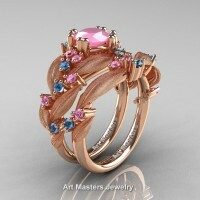 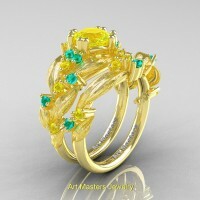 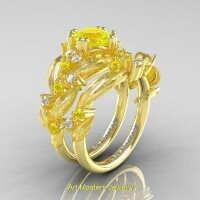 * All jewelry images are professional catalog renderings generated by jewelry production 3d imaging computers and are not real photographs, visual perception of images may differ slightly from screen type and resolution. Be the first to review “Nature Classic 14K Black Gold 1.0 Ct Black Diamond Pink Sapphire Leaf and Vine Engagement Ring Wedding Band Set R340SG-14KBGPSBD” Click here to cancel reply.